The Torbay Rail Trail is an 8km section of trail joining the towns of Torbay and Elleker. The trail accommodates walkers, cyclists and horse riders and follows the route of the old Elleker-Nornalup railway line. The trail passes through a range of habitats and makes for a great way to get out and enjoy the countryside and the wildlife. There is plenty of parking (including for horse floats) at both the Torbay Hall (Hunwick South Rd, Torbay) and in the park opposite the Elleker Hall (Hassell St, Elleker). 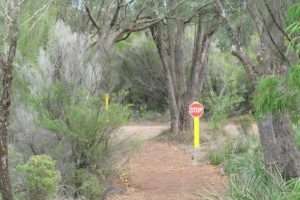 This trial is also used as a route for the Munda Biddi Trail, an off-road cycle touring trail, which stretches from Perth to Albany. It is the equivalent of the Bibbulmun Track for cyclists. TCG with Lotterywest funding was instrumental in planning and construction of this trail. We now maintain the trail with help from volunteers. If you are out on the Torbay Rail Trail and notice any issues (fallen trees etc) please report them to us. A wonderful coast hugging section of the Bibbulmun Track lies within the catchment. The scenery is magnificent and the coastal flora is wonderfully varied. Of course there are also a myriad of birds and other wildlife to be seen while out and about on the trail you may evenspot whales from some sections of trail at certain times of the year. The Munda Biddi is a long distance cycle touring trail stretching from Albany to Perth. At this stage close to Albany there is still affair bit of it that utilises the road. Once you reach Elleker it travels for just over 8km off-road using the route of the old Elleker-Nornalup Railway. It shares this route with the Torbay Rail Trail. From there it travels along scenic gravel roads for several kilometres. The gravel road scenery varies.One section boast the most brilliant summer display of the luminescent orange WA christmas trees. Other segments are karri lined and have vistas as far as the Porongorups and Stirling Ranges. A brief glimpse of Wilsons Inlet can even be spied in the right weather. In Bornholm, the trail goes off-road on the old railway route again for a short while before veering south towards Lowlands Beach via bitumen road and then onto another section of beautiful, purpose built cycling trail. More information can be found here. Some years back the series of small loop trails commencing at the Torbay Hall was created by a pair of dedicated locals. The trailsare located on both sides of Undeyup Creek and are great for bird watching or just a casual stroll. 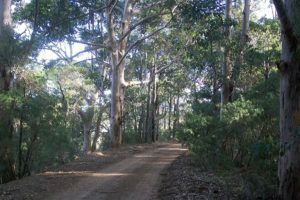 The trails travelthrough a variety of vegetation types from riverbank karris, to low lying heath, in parts dominated by Banksia quercifolia. Information about these trails is located adjacent to the Torbay Hall. The sign lists the birds which may be spotted along the trails. This is beautiful walk commences at Whaling Cove, which is also a great place to swim. The trail travels along Quaranup isthmus which is the narrow neck of land between Princess Royal Harbour and King George Sound. The trail is varied from beach walking, to steps and even some sections over granite. Along the way there are fabulous views of Princess Royal Harbour, Whalers Cove, Albany and King George Soundand on a clear day the Porongurups and Stirling ranges. There is always something of natural beauty to take in besides the scenery, and that could be anything from wildflowers to whales.